MtP400 Printers have been redesigned with a new sleek black look and are 13% lighter than ever! MtP400 printers are rugged, four-inch portable thermal printers that are ideal for label printing, as well as a printer for receipts, maps, and schematics. Designed to print in any orientation, the printer can be easily transported, mounted in a vehicle or carried on a belt or shoulder. Couple that with the printer's wide range of media options and you'll find the MtP400 to be the perfect mobile printing partner for your needs. The MtP400SL (slimline version) is a space-saving configuration which uses a convenient cut sheet paper cassette with simple drop-in loading. The pre-cut sheets present perfectly every time (i.e., minimum curling) and no tear off is required. The standard MtP400 model accepts a large continuous roll for a maximum number of print jobs between reloads. 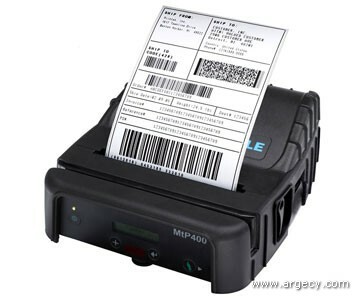 The MtP400LP is a thermal label printer optimized for label printing and includes gap sensing. A variety of accessories are available including: an AC wall adapter, vehicle mounting bracket, 4-bay external battery charger, 3-track simultaneous read MCR and an environmental case. More about the Printek MtP400 Series Mobile Printers can be found on the product's specification sheet. Click on the link above to view or download a PDF of the specification sheet.